OneBag has a long history of minimalism and OneBag3 will continue to uphold the standard of easy of use and simplicity it's predecessors set. Like the earlier versions, OneBag3 will continue to offer powerful options for those who wish to delve a little deeper. Also in the vein of earlier iterations I've kept to the philosophy of doing as little work as possible, as a result the code base is very small, and most of it is in the OneCore library. As of the time of writing there are only 268 lines of code unique to OneBag3, and only 1804 lines of code in OneCore itself. LoC is a horrible stat in general, but it's fun none the less, and I cheat horribly since I build off the powerful Ace3 libraries. Will automatically open and close for you when visiting the auction house, bank, mailbox, merchant or when trading with another player. Search inside of OneBag3 is powered by the LibItemSearch library by Jalibroc. As a result it supports many advanced search options. OneBag's brother who always like the safety of town, Bank does pretty much the exact same job for your bankslots as OneBag does for your character's bags. Lots of new functionality, Blizzard Sorting, Searching, and other hilarity. I'm updating here at least once a week when there's new releases going forward. Just an FYI, while this hasnt' been updated in over a year here, there's a much newer version over on curse.com. Not sure if it has any newer features, but at least has an undated .toc. Cannot rightclick items in bags to activate them... Swatter throws an error in OneBag 3 for it. Any fix? Hey, how do I use the SimpleSort plugin that comes with the addon? I can't find where to activate it. I've spent a lot of time trying to reproduce this and have been unable to. It sounds like there might be some conflicts in your UI. sorry can't delete this post. Last edited by kubasniakowy : 09-03-12 at 05:29 PM. I found a little bug since 5.0.4 and dont know if its me or OneBag/Bank3. Since the patch and installing the newest Version of this AddOn most the time i need to reopen the Bag to actualize it after moving or using an item. This is exactly what i miss too. 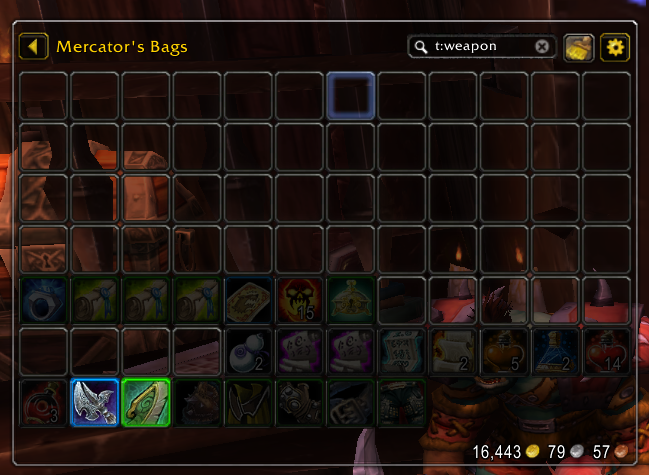 The addon is great, but a search field is sooo useful. is there anyway to make the search field added on 4.3 show on this mod ? Last edited by rassa : 11-30-11 at 09:41 AM. Not sure if this was intentional or not, but you seem to have downgraded your AceLocale to 3.0 from the previous 3.1 which is throwing out errors on the latest 2 versions of OneBank3 and OneRing3. v3.3.13 Has AceLocale-3.1 and does not give me any errors with v3.3.10 of OneBank3 and v3.2.8 of OneRing3. Both those versions also have v3.1 of AceLocale in them as well. What made you revert libraries? Having the same issue as a few other people with this. Open All Bags no longer works whilst OneBag is enabled. All the replies saying "switch your Open All Bags and Toggle Backpack" key are just wrong. I've done that so many times I've lost count. This is not a "simple" fix for it. The only problem I've seen with 4.1 (and it's really annoying) is that the bag key toggle is broken. i.e. B opens the bag, but no longer closes it. It's not 4.1 itself, as the toggle works if OneBag is disabled. There is a simple fix for this, press ESC click key bindings, find Toggle Back pack (should be Shift-B) and change it to B. worked great for me hope it helps.